Welcome to day 2 of the Honey Bee Brie Mine hop! Have you had a chance to check out the new Brie Mine stamps & dies? 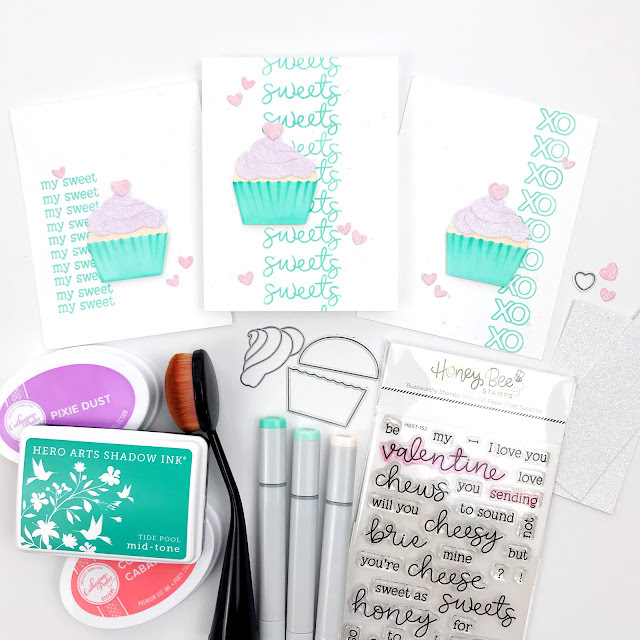 This release includes some sweet treats like candy & cupcakes, so of course I'm smitten! I love sugar even when I can't eat it, haha! I had fun doing some repeat stamping with some of the sweet new sentiments. Repeat stamping is one of my favorite ways to stretch my stamps and create my own backgrounds but its a technique that baffled me as a newbie stamper. When I saw other crafters' beautiful cards with repeated designs, I wondered how did they line that up and space it so evenly?! By the way, you should have arrived here from Amy's blog and you should be heading to Ilda's. Have fun hopping! So cute. Thanks for the tips. That cupcake is adorable. It does seem like a no brainer but thanks for showing us this tip! I really like the pink and teal/aqua colors together on this. Very fun cards. Thanks for the tip. I love repeat stamping but I don't do it enough. It does add a level of diversity. Great video and cards. The colors! Beautiful! I will have to try those colors together! Adorable cards. Love the repeat stamping idea, too! Love your card! The colors and repeat stamping are so fun! I love these colors and subtle sparkle! Great designs! Sweet card, literally! LOL Love the fonts...they are perfect! I'm loving the clean and fresh look of your cards! Such a fun way to create text backgrounds - and those cupcakes are superb! Carly, these are fabulous! I always love your sweet color combos! Your card is so pretty! What a fun theme release! Such sweet and yummy cards, I love the colours you used! Very cute card I love the colors!!! Thanks for sharing! Great cards, and you taught me something new, which is a bonus! Thanks! Sweet! Thanks for the tip on how to line everything up. Love the tips...super helpful! Cute cards! These are so cute , the repeat stamping always confuses me but that's not hard to do :) . Love the repeat stamping tips and your cards are just adorable. Your cards are so nice! I love the simple and elegant look. So sweet. Love the colors and sparkle. These cards are so sweet! Makes you wanna take a bite! Thanks for sharing! These are so pretty! Love the color combo! The cupcakes are absolutely yummy! I love the cupcake die!!! It’s defintiely on my list to purchase! Thank you for sharing!!! Don’t own a honey bee stamp! But just placed my first order so I’m very excited to get them! Three great card examples. Love them. they are so different from what everyone else is creating. Great tip for evenly spacing the sentiments. I like the soft color combination you used - so pretty! 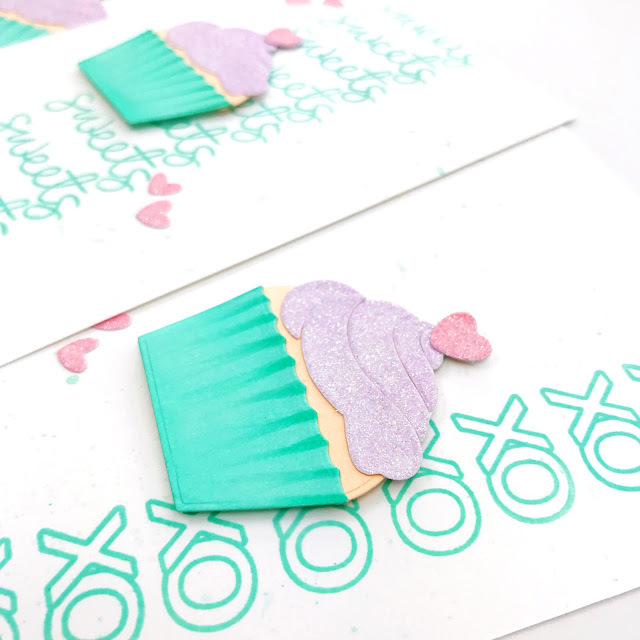 The cupcake builder die looks like it's a lot of fun to use, and all three of your cards are fantastic! Sweet cards! Love the tips in the video. Thanks! Love the simplicity and unique color combo. Very sweet card. Thanks for sharing. A great card with gorgeous colour choices, Carly! I love your stamped background using the word stamp - so simple but gives such a super effect! Thanks so much for sharing and inspiring us all! Such a delicious cupcake!!! Love your color choices. Love the background!! Your cupcake card is super cute! I love it!! Cute cards! Thanks for the tip on repeated stamping! So much depth to the cupcake. The glittery frosting is such a cute addition. NICE job! Adorable cupcakes, love the color combo. Nice size cupcake die. Love the color you chose! Thanks for sharing! Great card! Love the way you changed it by a simple background change. Sweet cupcake cards with repeat stamping background! Thanks for the video & tips! Love the cupcake card. Thanks for sharing. What sweet cards! And fantastic tips for creating it! I love that die set too! Can't wait to get it! thanks for some great inspiration! sweet set of cards - great color combo!! Love this collection of sparkly, glittery cupcakes! 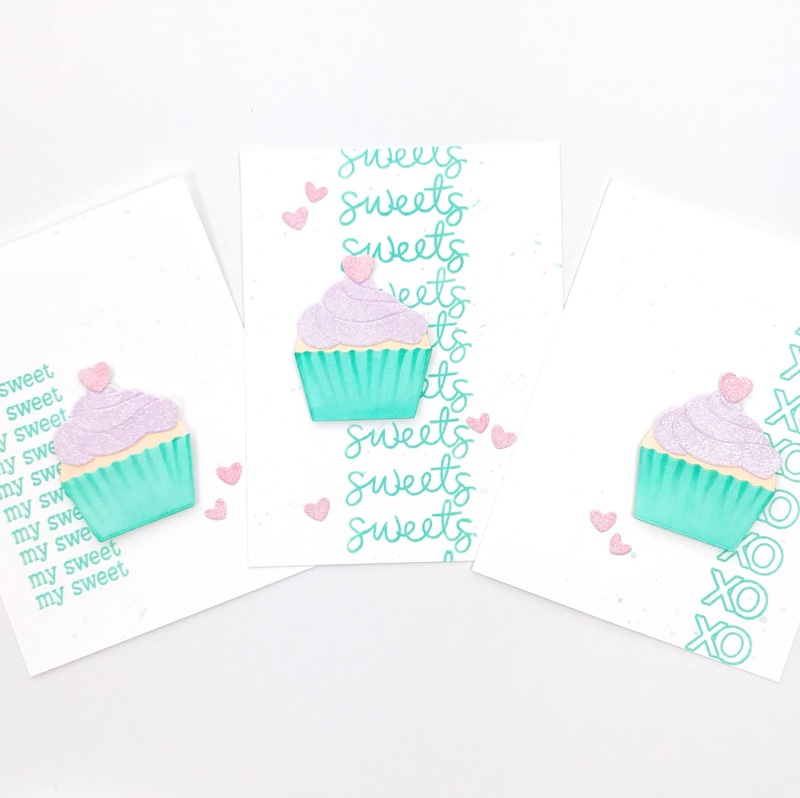 Super sweet cards with adorable cupcakes. Love the subtle shimmering and thank you so much for the helpful tip on repeated stamping! How sweet is that (TEEHEE). Love the colors, good enough to eat! TFS! SWOON!! Such a BEAUTIFUL Cards!! I LOVE the Designs and the HAPPY Colors you used!! THANKS for sharing and have a FABULOUS WEEK!! I love how you did this! Simply delightful! Wonderful cards - just love the sweet color combo! Thanks for the quick tips, too! Fab designs and palette on these sweet cards. Thanks for sharing your tips and the technique video. Wonderful design and beautiful colors. love the repeated sentiments, too. super cute! thanks for the great tips too. 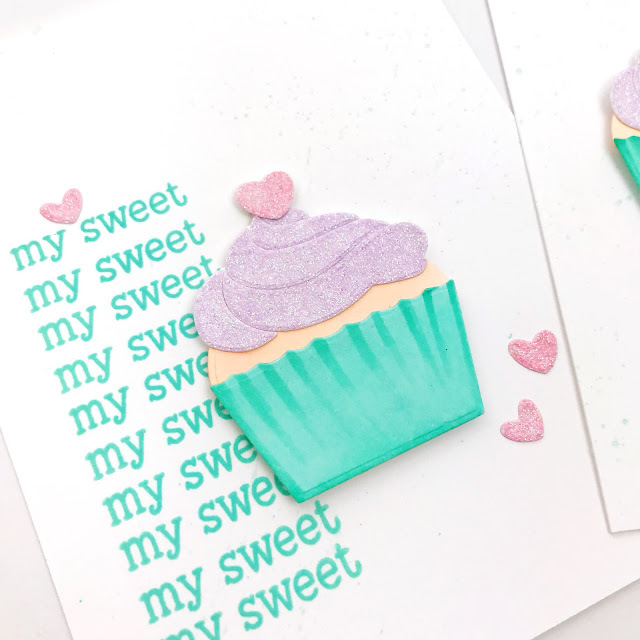 Love the colors you used on your cupcakes and the repeated stamping on the backgrounds! 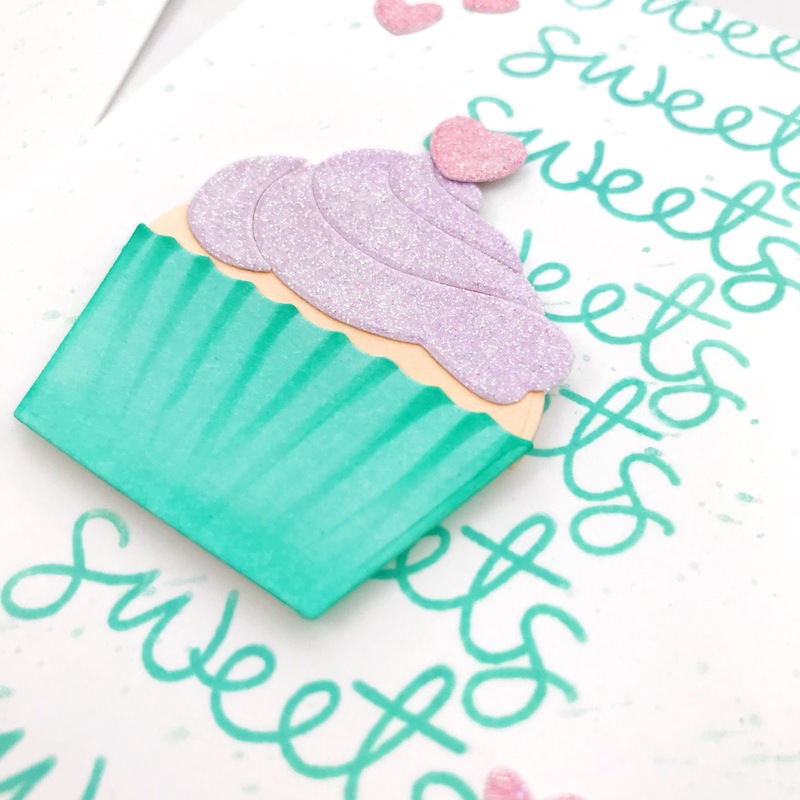 This makes the repeat stamping so easy! Adorable card. Fantastic cards! I love the soft colours! Super sweet cards! And great job on the repeat background!